SACRAMENTO–The Mattress Recycling Council’s (MRC) Bye Bye Mattress Program (Program) announced today it has recycled more than 3 million mattresses in California since its inception in 2016. The Program offers no-cost, environmentally friendly alternatives to Californians disposing of old mattresses through local collection sites, public events and collaborations with local retailers and solid waste providers. A recycling fee collected when consumers buy mattresses and box springs in California funds the Program. MRC uses the fee to establish free drop-off locations and collection events throughout the state. Collected mattresses are then transported from these sites to regional recyclers that dismantle and recycle mattress components. Consumers may take their old mattresses to more than 230 drop-off locations and collection events throughout California. The Program also recycles mattresses collected by retailers, hotels, universities and other sources that discard mattresses in large volumes. The Mattress Recycling Council was formed by the mattress industry to operate recycling programs (known as Bye Bye Mattress) in states that have enacted mattress recycling laws – California, Connecticut and Rhode Island. 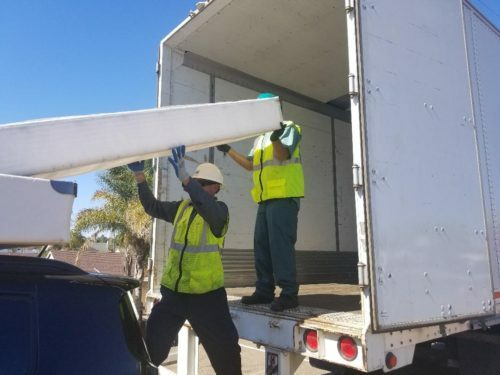 Since its inception in 2016, the program has recycled more than 3 million mattresses in California collected from a network consisting of local governments, solid waste facilities, nonprofit organizations and small and minority-owned businesses throughout the state.